In-vehicle auto electrical installation company SM UK is a growing company with an impressive client list that includes Mercedes Benz, Tesco, Imperial Commercials and Eddie Stobart. As its business grows, so does is its admin workload. Seeking an efficient solution to reduce the growing paperwork and automate its jobs-to-invoice procedures by introducing electronic proof-of-delivery (ePOD), it turned to technology partner OBS Logistics (OBSL) for a solution. 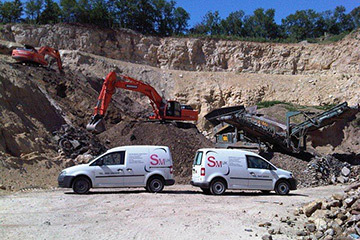 SM UK installs in-vehicle electronic and electrical systems for the UK’s largest vehicle operators and logistics companies. Its services are trusted by many blue chip companies, including Mercedes Benz, Tesco, Imperial Commercials - the largest DAF distributor in the UK - and Eddie Stobart. The company supplies and installs reversing cameras, hands-free communications, vehicle equipment warning systems, PSV CCTV, power monitoring with active management and satellite vehicle tracking systems. The company’s team of 15 mobile engineers are based from their homes, with territories that cover the vast majority of the British Isles. The paperwork it generates is burdensome and so SM UK sought an innovative solution to streamline its administrative workload. Turning to OBS Logistics, its partner for CALIDUS Transport Management Systems, SM UK found an answer to reducing its expanding administration requirement. To streamline its business processes, OBSL will provide its special electronic proof-of-delivery (ePOD) technology. This will run on Windows-based PDAs issued to the company’s mobile service and installation engineers. SM UK is seeking a number of benefits from its ePOD investment. Primarily the company wants the ability to eliminate the mountain of paperwork generated with each job and reduce the time it takes to invoice customers for completed jobs. "We need to streamline the back office processes as we are groaning under the weight of the paperwork. The volume is growing and to process it manually would need more admin staff, which is an overhead we wish to avoid," says Steve MacDonald, MD, SM UK. "ePOD will make a huge difference to our operation, allowing us to grow the business without having to increase our administrative overheads, it will boost our efficiencies and help us to deliver service improvements to our customers"
"It also takes a long time to get things processed. It can take up to 10 days to complete the paperwork and send out the invoice, once a job has been completed. This 10-day delay adds to the 30-day payment terms we have with our customers, resulting in a 40-day turnaround in payments. The new ePOD system will reduce the time considerably as we’ll be able to invoice as soon as a job is completed and signed off by the customer, which will substantially improve cash collection and cashflow," he adds. The ePOD system will replace the traditional methods of job notification and recording used by the SM UK engineers. Instead, the handy PDAs will present the jobs directly to the engineers automatically. The system uses clever integration with SM UK customers so that job orders are imported directly and these are sent electronically to the PDAs. The live system also updates each engineer’s jobs in real-time. When a job is completed, the customer signs a signature capture screen on the PDA to record that the work has been done and is satisfactory. The proof-of-delivery is transmitted instantly (if there is adequate GSM coverage; if there isn’t the system retransmits as soon as the PDA is within range) to the SM UK head office in Leeds. When the SM UK computer system receives the proof-of-delivery, an invoice is sent immediately to the customer. There is no additional data to be transferred or re-keyed into the system, which increases accuracy. The system will also provide a detailed electronic work report and history file for each customer, with all jobs listed and with details of who signed them off with their captured signatures. Instead of searching through paper records, the customer service team can interrogate the system quickly to resolve any queries. "We aim to be live with ePOD by the end of the year. It will make a huge difference to our operation, allowing us to grow the business and without having to increase our administrative overheads. It will boost our efficiencies and help us to deliver service improvements to our customers," concludes Steve MacDonald.